CH Bus delivers Temsa TS 35 to Mass. 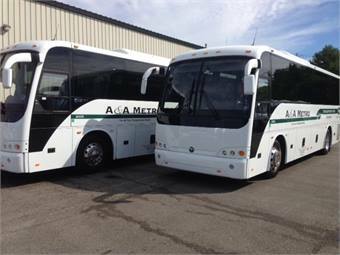 Mass.-based A&A Metro Transportation, a division of Bill’s Taxi Service Inc., added two 2014, 40 passenger Temsa TS 35 mid-size motorcoaches. The TS 35 is a fully integral mid-sized coach constructed from stainless steel for extra durability. All Temsa coaches are equipped with a Cummins/Allison drivetrain, and A&A’s coaches also offer quality features, such as 110-volt plugs, Alcoa Dura Bright wheels, an auxiliary preheater, rear camera, a rear window and an Elite REI A/V system.